Whenever I open up the archives of my past, it is my grandfather I have to thank for the Kodachrome hues in which those old memories are framed. At any given family function, his finger pulled the trigger on what would be included or excluded from the family’s photographic archives. Whenever my mind pulls up a memory, or creates a dream, it is out of the matrix of Grandpa’s photos that I construct my personal little movies. In the days, when my grandpa was a shudder jockey, cameras hadn’t yet mated with cell-phones. Digital technology was nothing more than a twinkle in the eye of our nation’s post-Sputnik innovators. Taking a picture was far rarer than it is in our camera-saturated/Internet-enhanced world. In those days, my camera-toting grandpa was something of an oddity. I can recall how he would line us up for one completely un-spontaneous Kodak moment after another. Getting the seven children in our family, along with two adults to stand still, while feigning expressions of relaxed jocularity was just one skill set necessary in the complex dance that was family photo journalism. The other set of skills had to do with operating cumbersome, and ever-evolving equipment. My earliest memories of grandpa’s photography were mediated more through my olfactory than optic nerves. After a “click,” and a “foof,” a puff of blue smoke would rise from the burning ember of a spent bulb that was then discharged into a cooling receptacle (an ashtray). 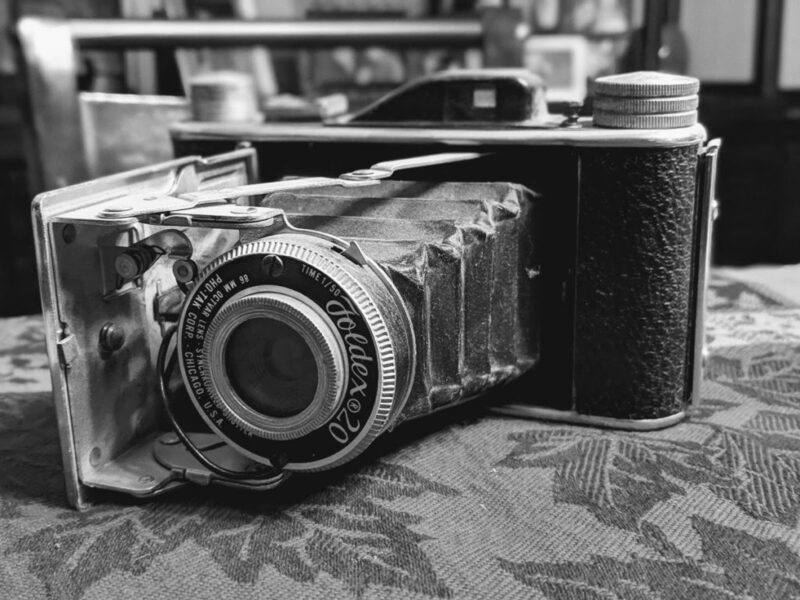 I remember my brother’s surprised howl when he reached a curious finger into the ashtray to examine one of grandpa’s smoldering camera-embers. With the aid of an ice cube, and orange flavored children’s aspirin, his pain faded at about the same time that it took our retinas to recover, and the balloon images to fade from our eyes. Several summer’s ago, the camera film made famous by Paul Simon’s song bearing the same name, “Kodachrome,” was discontinued. The report I read said that the proliferation of film-free digital cameras had reduced demand for this high-end, high-resolution product to a mere trickle. Looking back, my kids, wife and I began contributing to Kodachrome’s demise around a decade and a half ago. That’s about the time when we switched to a film-free, digital camera. With that conversion came the loss of a family job. In the days of twenty-four exposures per roll, and a fee for processing them, picture-taking was an adults only enterprise. Now, with instant review capabilities built in, a shaggy dog photo can be immediately discarded cost-free, making room for a later, better picture. As a result, the role of family photographer has become decidedly less centralized. Gone are the days when vacations were shot exclusively from the perspective of an adult’s eyes. Now, our photo album includes pictures from multiple perspectives. And sometimes the pictures taken from those new perspectives are not so flattering—as in the vacation morning when angry dad feels like he’s not getting enough help packing up our camp to go home. But it seems to me, that even in the days when grandpa was in charge of what went into the family photo album, clandestine pictures were being taken by multiple family members all of the time. Just after my father’s death, I underwent a round of psychotherapy that brought to light some long forgotten memories (internal pictures) that I had unconsciously taken and internalized. In the internalized photo album of my memory, I got in touch with a clear picture of my father regarding me with something that seemed like loathing. It first showed up around the time I entered adolescence, and appeared more and more frequently as my teen-aged years continued. Like the dad in Johnny Cash’s song, “A Boy Named Sue,” my father was consciously trying to toughen me up for a world that can be brutal on an adolescent boy. The problem was, that when the adolescent bullying finally did show up, I just figured those fellas were seeing something in me that my dad had been noticing for a long time. Rather than letting taunts and torments role off my back, I internalized them, just like I had unconsciously internalized the photograph I had taken of my dad. As human beings, endowed with intellect, imagination, and soul, we are busy framing up meaningful pictures all of the time. And the scary thing is, we are not in charge of the pictures that our children, spouses, or significant others are constantly taking of us. As I got in touch with just how thoroughly I had internalized my dad’s critical view of me, I grew in my awareness of how frequently I directed a critical glance toward my adolescent boy and girls. My stated intention, was to help them shave off those rough edges so that they could better socialize with their peers, etc…,etc…, etc…. As the old saying goes, “What you don’t transform, you transmit.” Who knows how many generations of Wagner men have carried around an old unconscious photograph of a critical father that limited their joy, and that they, in turn, passed along to their sons/daughters? In this Sunday’s Gospel selection (Luke 4: 14-21),Jesus announced his intention to set us free from those pictures that have blinded us to the truth of who we really are: beloved sons and daughters made in the image and likeness of God. It is important to give our kids corrective feedback. But even more important than that, our job is to strike an authentic pose as a mom or dad or significant adult, regarding them with unambiguous delight…just the way they are. Bursts of DelightWhen you arrive home at the end of the day, before you walk through the door, resolve to provide a thirty second burst of positive energy and delight in whomever is home on the other side of that door. Make sure your eyes, your smile, and your words communicate unambiguous delight in this person.